Yet another fun weekend of live Creative music in Connecticut and we start in Waterbury. The Mattatuck Museum, 144 West Main Street, presents the Brandee Younger Trio at 6 p.m. on Thursday May 1 as part of its Music @ The Matt series. Ms. 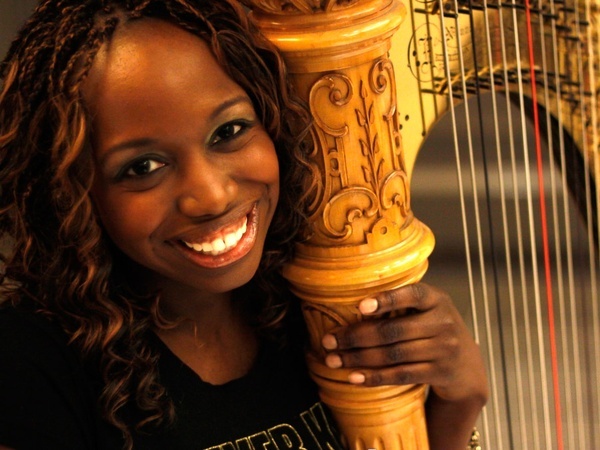 Younger is a harpist who received her undergraduate degrees in Harp Performance and Music Business at the Hartt School of Music and has worked alongside Jack DeJohnette, Ravi Coltrane, Marcus Strickland and Charlie Haden. She is also busy in the classical world, performing with the Waterbury Symphony, the Eastern Connecticut Symphony and Camerata New York. She has only released 1 CD under her own name (2011). Not sure who's in the rhythm section but expect the music to go where few harpists dare to. To find out more about her life and music, go to brandeeyounger.com. For ticket information and more, call 203-753-0381, extension 130. Give a listen below. It is shaping up to be a very musical weekend at The Side Door Jazz Club in Old Lyme. On Friday May 2, the Club presents The Cookers, a septet of musicians led by trumpeter David Weiss. Weiss organized the septet over 5 years ago, bringing in musicians such as Billy Harper (tenor saxophone), Dr. Eddie Henderson (trumpet) George Cables (piano), Billy Hart (drums) and Cecil McBee (bass), all of whom began their careers in the 1960s or early 70s. If you look at each player's CV, you'll see they straddle the lines between hard-bop, mainstream jazz and the avant-garde. Add to that sextet alto saxophonist Craig Handy (who's 15 years younger - on average - than his bandmates, save for Weiss) and they make music that is fiery, rhythmically exciting, very much alive and powerful. The band has issued 3 CDs (on 3 different labels), all of which feature old and new compositions by band members. The rhythm section alone would make for a great show. Reservations are a must so call 860-434-0886 or go online to thesidedoorjazz.com. 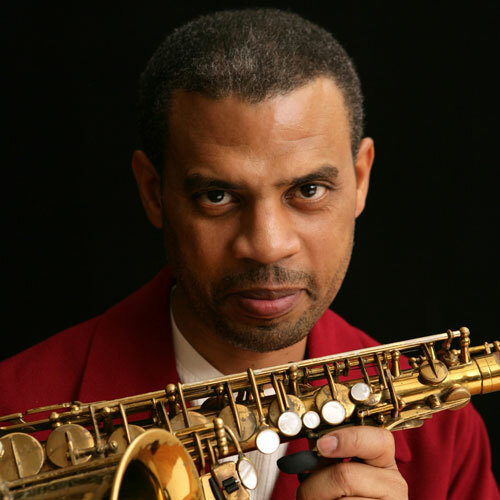 On Saturday, The Side Door opens for alto saxophonist/composer Steve Wilson and his quartet known as Wilsonian's Grain. 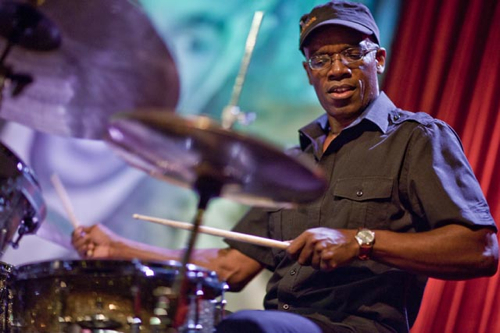 Wilson, who is one of the most sought-after sideman in contemporary music, works or has worked with the Maria Schneider Orchestra, Dianne Reeves, Bill Bruford, Dave Holland, Christian McBride and a slew of others. He possesses the sweetest tone but also can play with great fire. 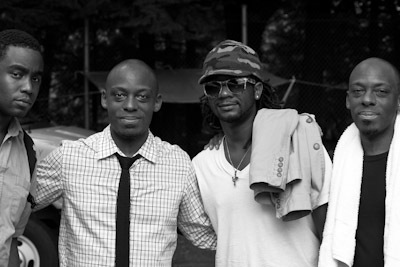 His group, which he organized in 2008, includes pianist Orrin Evans, bassist Ugonna Okwego and drummer Bill Stewart. Sadly, they have yet to record but WBGO-FM recorded them "Live at The Village Vanguard" in March of 2010 and you can hear that set by clicking here. I would hate to have the make the choice as to which group to hear at the venue this weekend; perhaps, you should make reservations at The Old Lyme Inn and see them both. Also on Friday night, cornetist/composer/arranger Taylor Ho Bynum returns to Firehouse 12, 45 Crown Street in New Haven, with the Sextet that recorded his excellent new CD/Lp project "Navigation: The Complete Firehouse 12 Recordings" (released on vinyl, CD and digitally by Firehouse 12 Records). The ensemble, people who have worked with Bynum for over a decade, includes Professor Bill Lowe (bass trombone, tuba), Jim Hobbs (alto saxophone), Ken Filiano (acoustic bass), Mary Halvorson (electric guitar) and Tomas Fujiwara (drums). The music on the recording moves in many directions, filled with strong solos and intelligent interactions. Click on the link below to hear for yourself but, to see for yourself, call 203-785-0468 or go to firehouse12.com. 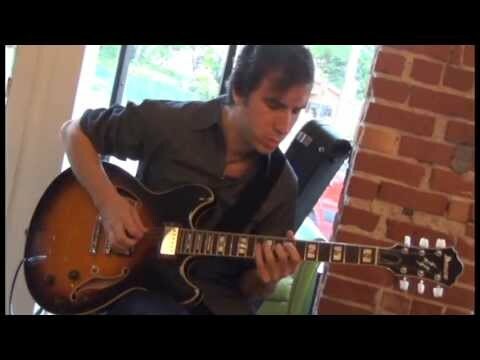 Sinan Bakir, the young Turkish-born guitarist who makes his home in the Hartford area, returns to The Buttonwood Tree, 605 Main Street in Middletown. This time, he's playing a solo show at 8 p.m. If you have never heard him play, Bakir has truly matured in the past few years. Yes, he can play very fast but now melodies and smart improvisations are most important to his program. For more information and reservations, go to www.buttonwood.org or call 860-347-4957. There, you can see that this weekend is filled with great guitar music from Friday's show with ensembles from the Guitar Department at The Hartt School to Sunday's 5 p.m. show with the Mike Lorenz Guitar Trio. Hard to believe it's been just over 3 years since Posi-Tone Reecords released the self-titled debut CD from the Captain Black Big Band. Culled from 3 live dates, the music was hard-hitting, raucous, even fevered at times but filled with soulful melodies, smart arrangements and great solos. 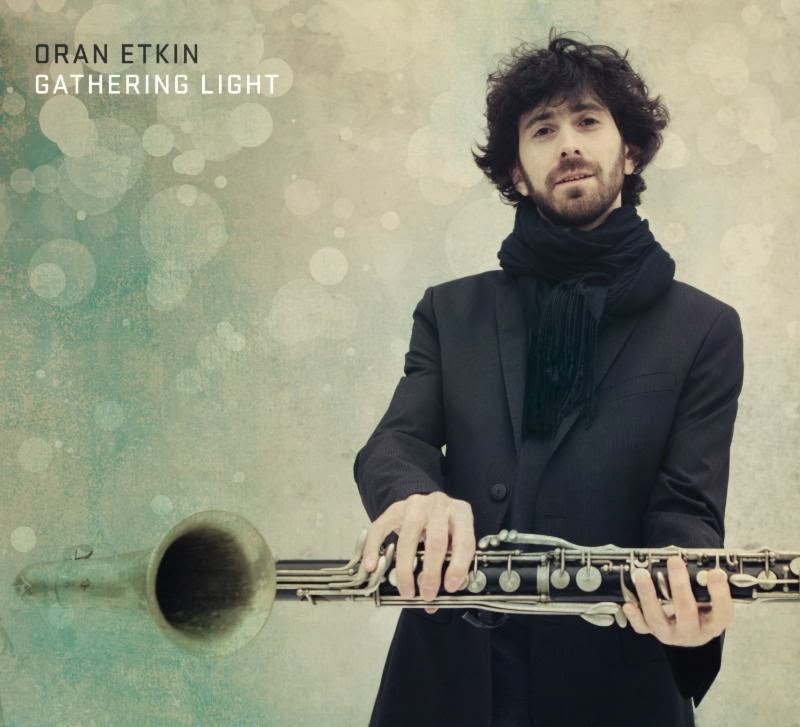 8 months after that release (11/11), pianist, composer, founder and leader Orrin Evans took the band into Systems Two in Brooklyn to record the follow-up. Partially crowd-funded through United States Artists (find out more about the organization here), "Mother's Touch" is even better. 6 of the 9 tracks are Evans' originals with one each from Eric Revis, Donald Edwards and Wayne Shorter. 6 different arrangers contributed to the program with the 2-part title track (cuts 3 and 8) attributed to the 20-member ensemble made up of approximately 5 trumpeters, 7 reed players, 5 trombonists and a rhythm section. The opening track, "In My Soul", welcomes the listener with warm reeds and brass, a slow blues featuring excellent solos from Evans and tenor saxophonist Marcus Strickland. Gianluca Renzi's arrangement has the flavor of Julius Hemphill in the lush saxophone melody and Thad Jones in the brass. Trombonist David Gibson arranged Evans' piece "Explain It To Me", a piece that blends a fiery Latin feel with several straight-ahead sections. 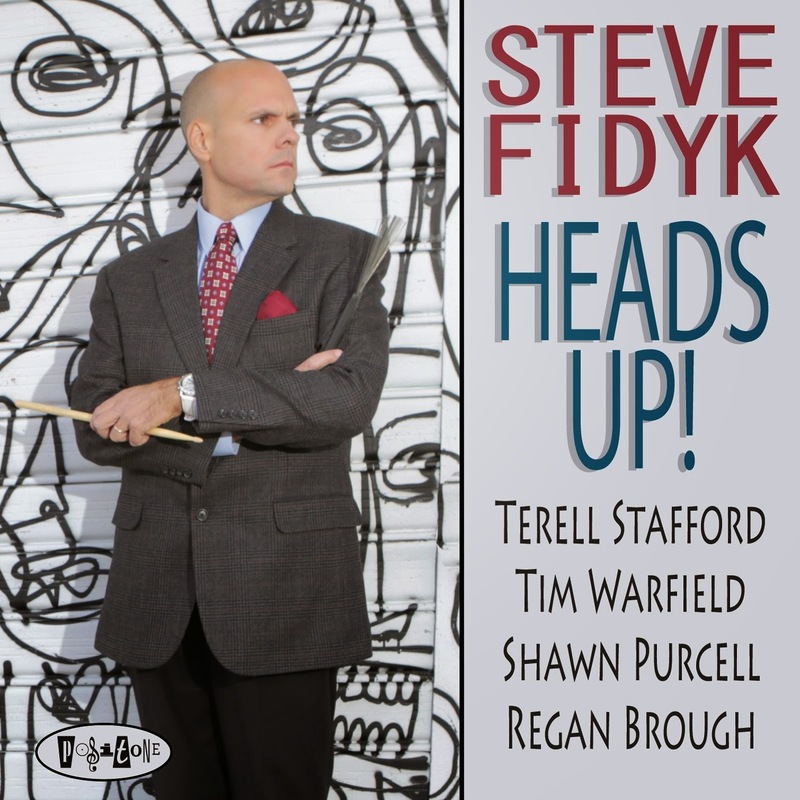 Strickland delivers a soaring soprano sax solo while Ralph Peterson drives the band with his usual abandon - it's the drummer's only appearance on the CD with the bulk of the tracks driven by Anwar Marshall. The pianist's sweet ballad "Dita (for Karyn Warren)" has a lovely melody that Evans delivers in a most deliberate manner and the alto solo from Todd Bashore (who arranged the cut) is short but loaded with soul. The arrangement calls for clarinets and flute plus a sweeping trumpet counterpoint and low trombones. Edwards' "Tickle" is a straight-ahead "barn burner" that smokes all the way through its 4:06, especially when tenor saxophonist Stacy Dillard flies atop the amazing bass and drum work. Evans follows with his own energetic solo. Revis, who is the bassist in the trio Tarbaby as well as long-time member of the Branford Marsalis Quartet, penned "Maestra"for the latter group. Here, the handsome ballad gets a funky makeover with a classy arrangement by Laura Kahle Watts (wife of drummer Jeff "Tain" Watts) featuring strong support from Evans plus fine solos from Victor North (tenor sax) and Fabio Morgera (trumpet). Trumpeter Tatum Greenblatt created the arrangement for Wayne Shorter's "Water Babies" with its fine "call-and-response" featuring the soprano sax and muted trumpets at the onset. 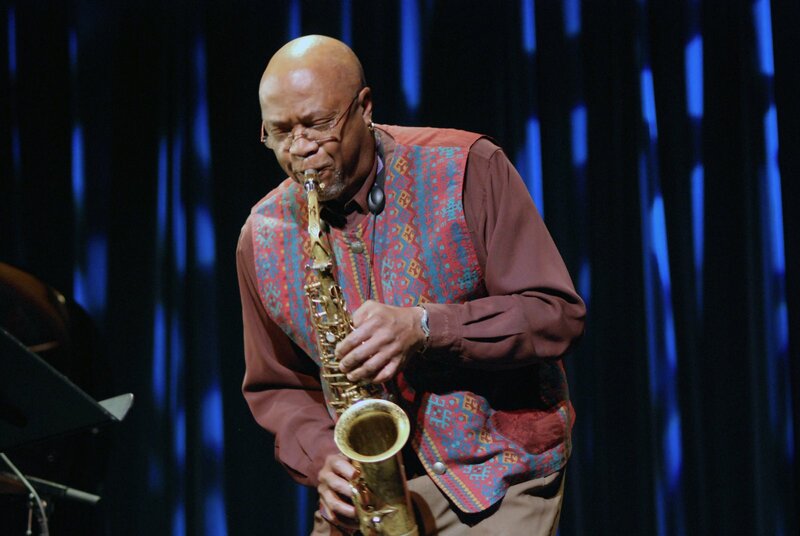 The program closes with "Prayer for Columbine", an Orrin Evans composition first recorded with drummer Ralph Peterson on his 2003 "Tests of Time" Criss Cross release (there is also an Evans Quintet live version from 2013 - you can watch it here.) Here, the Todd Marcus arrangement speeds the piece up a bit while creating a sweeping arrangement of the melody line from the trumpets (with saxophone counterpoint and trombone support.) 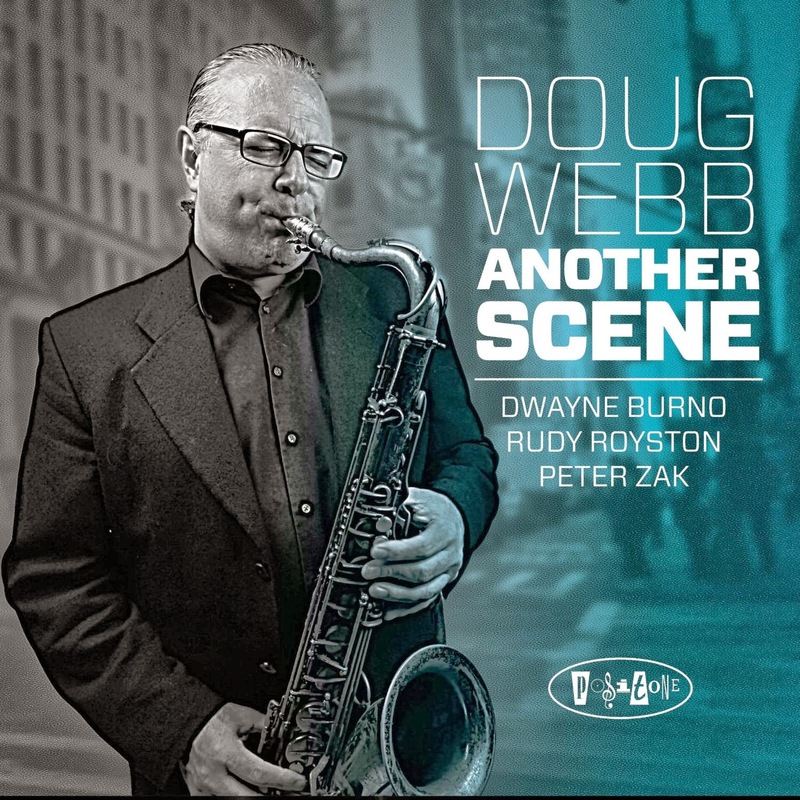 The tension builds throughout the 4 solos that start with trombonist Conrad Herwig and moves up to baritone saxophonist Mark Allen and then onto a conversation with the alto saxophone of Tim Green and tenor sax of Stacy Dillard. By the climax of the piece, the 2 men are center stage, their sounds converge then take the piece down to its quiet conclusion. "Mother's Touch" is an excellent recording, from the compositions to the arrangements to the solos. The sound is stunning, crisp drums and piano stand out as does the way the mix spreads the reeds and brass sections around the spectrum. Orrin Evans makes a positive impression with every project he creates, he questions conformity and makes political statements yet does so with true belief. 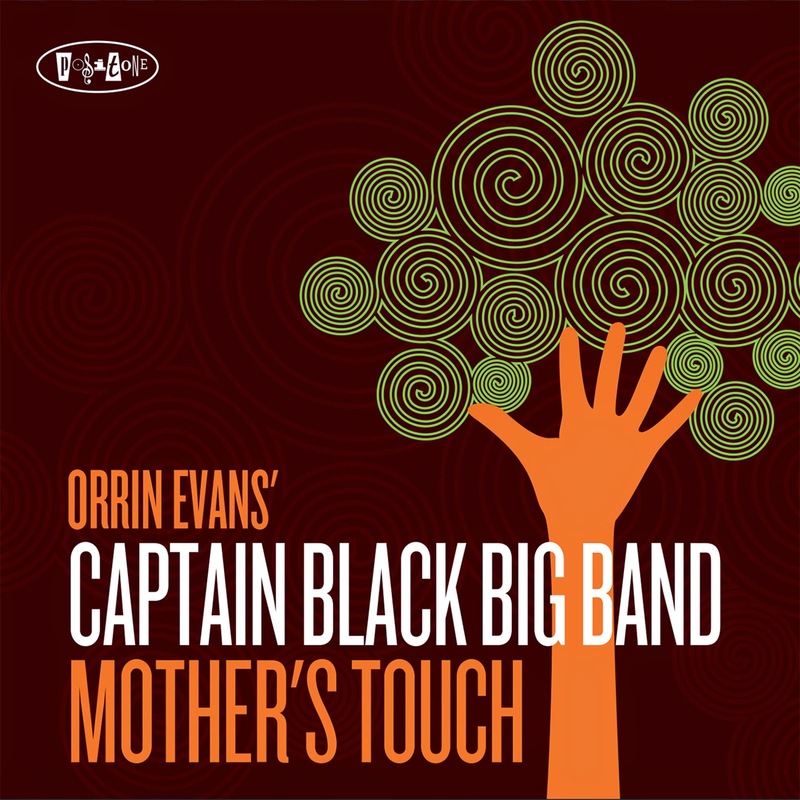 If you like large ensemble music, you should love the Captain Black Big Band! To make the connection, go to www.facebook.com/pages/Captain-Black-Big-Band/103205286379384. If you listen to WBGO/NPR's "Live at The Village Vanguard", you may remember the June 27, 2012 edition that featured the Marc Ribot Trio (you can still listen online by going to www.npr.org/event/music/155441977/marc-ribot-trio-live-at-the-village-vanguard). 3 nights later, the Trio played the music that is featured on its new CD "Live at The Village Vanguard" (Pi Recordings). Like the earlier performance, the set here includes pieces by Albert Ayler, John Coltrane and 2 standards. They switch the order around, starting the CD set with Coltrane's "Dearly Beloved" (it's the closing piece on the NPR set while the CD's fourth track, "Bells" opens the radio set.) 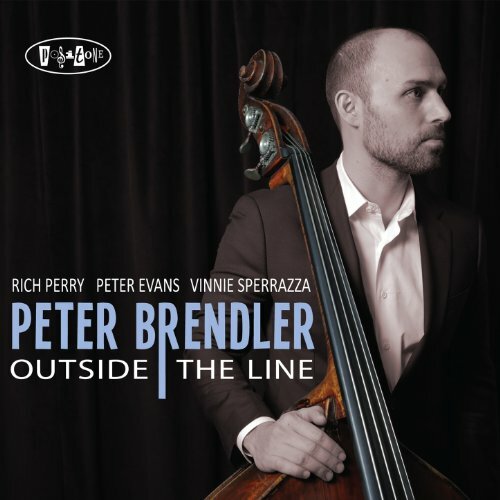 Bassist Henry Grimes goes it alone for the first several minutes with an impressive bowed solo that quietly introduces Ribot and drummer/producer Chad Taylor. Stealthily, they build the intensity over a rubato setting before kicking the piece into a higher gear. As Ribot begins to "wail", Grimes and Taylor create a rhythmic storm. At the climax of the guitar solo, Taylor takes a powerful solo to the end of the piece with the guitar and bass joining to close the performance. The ensemble then breaks into a "rockabilly" beat for Ayler's "The Wizard" first recorded on the saxophonist's 1965 ESP release "Spiritual Unity". It's amazing where the Trio takes the piece as one hears echoes of Carlos Santana and Thurston Moore in the guitar solo. Although the pace slows down for Grimes' energetic solo, the bassist brings such intensity to his work that both Taylor and Ribot pick up on it and then bring the piece up to another roar. The reading of "Old Man River" (composed by Jerome Kern and Oscar Hammerstein II for 1927's "Showboat") displays Ribot's fine blues chops, his ability to build a solo off the melody and his intelligent rhythm guitar backing. The other standard, "I'm Confessin' (That I Love You)" is from 1930 and has been recorded by Louis Armstrong, Les Paul & Mary Ford, Anne Murray and, most recently, Tony Bennett & K.D. Laing. The Trio really "swings" the tune, with great brush work, a bouncy bass line and a rippling guitar solo. The musicians have great fun with Ayler's "Bells" over its 19-minute journey. Starting quietly in a folk vein, the music builds slowly to a long bass solo (more excellent arco work) and, when Ribot re-enters at the 7-minute mark, the music goes through a number of impressive changes, from a "free-form hoedown" to a fiery "free" blast closing on a hearty drum solo. The CD's closing cut, Coltrane's "Sun Ship", caps off the set with a another blazing guitar solo that builds over 5 minutes to a howling climax into a thundering drum solo and a short reiteration of the theme. Play it loud, play it often! "The Marc Ribot Trio: Live at The Village Vanguard" will make you sweat, swear, holler, smile and, ultimately, clap your hands at its audacious musicality. 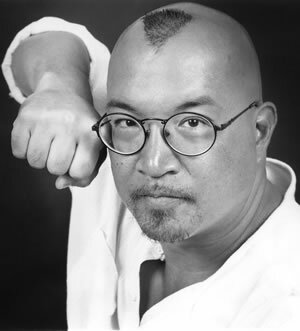 For more information, go to www.marcribot.com. The duo of Kendra Shank (voice, electronic looper, effects, shaker) and John Stowell (guitars) has worked together on-and-off for over 2 decades. "New York Conversations" (TCB Records) was recorded in 2 sessions at the guitarist's long-time friend John Stowell's studio in New York City (guitar overdubs were recorded by Stowell in Portland, Oregon.) The results prove to be one of the more "playful" collaborations heard recently. The program includes 4 completely improvised tracks plus several that sound spontaneous, such as Stowell's bluesy "Throop." "Rush Hour" features acoustic guitar and wordless vocals with the duo dancing around each other while "Za-Zoh" finds Ms. Shank setting the pace with her sweet nonsense lyrics, "looped" vocals and long tones. The rhythmic interactions on "WalkTalk" give way to a vocal hi jinx (thanks to the octave divider and looper). The final track is also the 4th improvised cut; in 75 seconds, "Glad Mango" is a joyous dance with bright Brazilian overtones. There are also several standards sprinkled into the program. The CD opens with a wistful take on Irving Berlin's "Blue Skies" - the vocal begins in a straight-forward manner but Stowell's guitar fills push the piece into a more percussive direction. The Rodgers-Hart classic "My Romance" (from the 1935 musical "Jumbo") is one of the pieces that sounds spontaneous with the wonderful interaction of the wordless vocals with the sprightly acoustic guitar. Ms. Shank gets to the lyrics after a sweet guitar solo and her playful take meshes nicely with the guitar. "Like Someone in Love" (from Jimmy van Heusen and Johnny Burke) opens with a lovely vocal but it's Stowell's delightful guitar solo that stands out. Ms. Shank's stunning vocal reading of "I'll Be Seeing You" (Sammy Fain and Irving Kahal) stands out in its sincerity and honesty. The medley of Woody Guthrie's "Hard Travelin'" with the traditional "Motherless Child" rises up from Ms. Shank's vocal drone. The voice and the bluesy licks from the guitars give the track its dark feeling. The title track adds Ms. Shank's lyrical tour of the New York City neighborhoods to Mr. Stowell's original "Lonely Blue Angel" while "Ghost" is a memory of one of the vocalist's close friends who took his own life. The latter piece is suffused with the light of understanding that life is fragile and "..much to short not to forgive...now." The gentle feel of both vocal and guitar is buoyant and kind. "Simple Pleasures" affixes wordless vocals to a handsome Stowell melody; the looped voices give the piece its dreamy quality while the fine acoustic and overdubbed electric guitar work adds a lovely counterpoint. There is much to digest on "New York Conversations" but one cannot miss the obvious affection that Kendra Shank and John Stowell have for each other and this project. They do not force the action, the songs move organically, even the "electronic effects" feel just right. This music might not knock you over but there are a surplus of moments that will give you great comfort. For more information, go to www.kendrashank.com. "Fourteen" (Pi Recordings) is the fifth CD that Dan Weiss (drums, percussion, compositions) has issued and the first with more than 3 musicians; in fact, the title refers to the number of participants. His Trio partners, pianist Jacob Sacks and bassist Thomas Morgan, are here as is his duo partner, guitarist Miles Okazaki. Joining them are Matt Mitchell (glockenspiel, organ, piano, clapping), David Binney (alto saxophone), Ohad Talmor (tenor sax), Jacob Garchik (trombone, tuba), Ben Gerstein (trombone), Katie Andrews (harp), Stephen Cellucci (percussion, clapping) and the vocal trio of Lana Cenčić, Judith Berkson and Maria Neckam. The music is divided into 7 "Parts" with moments that sound like "progressive rock" from the 1970s, sections that reflect Weiss's lifelong interest in Indian drumming, limpid vocals that recall Steve Reich, quiet passages of acoustic guitar with glockenspiel ("Part Two") or tuba with trombone ("Part Five"), majestic piano melodies over a forceful rhythm section ("Part Six"), and long tones that juxtapose voice, piano and trombone ("Part 7"). The best way to experience "Fourteen" is to start at the beginning and listen to the end (just under 38 minutes). Some of the moments are soft and lovely, others hard and stark but the overall experience is cathartic, a cleansing of the mind and, even, a sense of rebirth. In so many ways, "Fourteen" is a reflection on living in unsettled times. Dan Weiss has created a master work, one that reverberates long after the last quiet notes fade. For more information, go to danweiss.net or pirecordings.com. 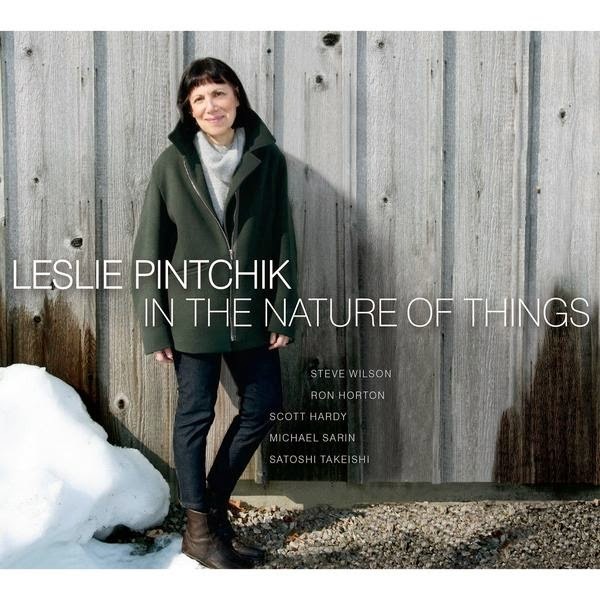 Pianist/composer Leslie Pintchik writes music that asks the listener to relax, block out the everyday world and our performances will entertain without ever speaking down to you. "In the Nature of Things" (Pintch Hard Records) is her 4th recording as a leader and it's quite a treat. First of all, Ms. Pintchik has a dynamite rhythm section, with long-time associates Scott Hardy (bass, horn arrangements) and Satoshi Takeishi (percussion) plus Michael Sarin (drums). Saxophonist Steve Wilson (soprano, alto), who appeared on the pianist's second album is back, joined here on the front line by Ron Horton (trumpet, flugelhorn) - they appear on 6 of the 9 tracks. There's an airy quality to the majority of the tracks, a spaciousness that suggests contemplation yet also an intensity created by the joyful interaction of the musicians. On first listen, the standout track is "I'd Turn Back If I Were You", with its Crescent City groove and splendid piano work (there are seriously low notes at the end of each chorus). Wilson and Horton get in the groove, adding colorful splotches atop Sarin's dancing drums. After several listens, one's attention is arrested by the truly delightful quartet reading of Lerner & Loewe's "I've Grown Accustomed to Her Face". Takeishi and Sarin mesh well, the quiet hand percussion (bells and blocks) alongside the splendid brush and cymbals supporting the pianist. Hardy, who first worked with Ms. Pintchik as a guitarist, is quite the melodic bass, his full tones filling the spaces beneath the gentle piano chords. Wilson and Horton share the theme section of the Brazilian-infuenced "Luscious" - after a fine piano solo, the saxophonist plays a lively solo on soprano. Horton takes a spirited solo on "Sparkle" followed by Wilson, this time flying above the rhythm section on alto. Several of the tracks use the reeds and brass as either counterpoint or for adding extra shading in the background. Do make sure to pay attention to the pianist, especially her fine solos. Ms. Pintchik may not be a flashy soloist but she can certainly swing (the live version of "There You Go" that closes the disk is ample evidence of her ability.) She is also exceptionally melodic, not unlike Dr. Denny Zeitlin. Listen to how she sets the table for Horton and Wilson on "Ripe", giving them the first 2 solos before stepping into her own fine statement. In the liner notes, Leslie Pintchik acknowledges the influence of Herbie Hancock's 1968 Blue Note recording "Speak Like a Child", not so much in the instrumentation as in the approach to the material, the prominent role of the rhythm section (Ron Carter and Micky Roker with Hancock) and her solos, which often stay in the middle of the keyboard. "In The Nature of Things" is inspiring and comforting music, well worth exploring time and again. For more information, go to www.lesliepintchik.com. Stephen Haynes (cornet) and Joe Morris (bass, guitar) are the hosts and curators of the monthly "Improvisations" series at Real Art Ways in Hartford. The gentlemen are taking the "show on the road", down Route 84 to Waterbury on Thursday April 3 to the "Music at the Matt" series, held on the first Thursday of the month at the Mattatuck Museum/Historical Society, 144 West Main Street. Joining them for this all-improvised concert will be drummer Tyshawn Sorey (pictured left), Wesleyan graduate currently working on his Ph.D at Columbia University in New York City (when he's not traveling the world performing.) The concert, billed as Stephen Haynes and The Button Trio, starts at 6 p.m. For more information, call 203-753-0381, extension 130 or go to www.mattatuckmuseum.org/jazzthursday. The Firehouse 12 Spring 2014 Concert Series is in full boom (even if the season is late in arriving). This Friday (April 4), the New Haven performance space/recording studio welcomes Kneebody, the lively quintet that happily crosses genres with abandon and has since its inception 13 years ago. Composed of musicians who met at the Eastman School and at the California Institute of the Arts, the ensemble - keyboardist Adam Benjamin, trumpeter Shane Endsley, electric bassist Kaveh Rastegar, saxophonist Ben Wendel and drummer Nate Wood - has issued 9 albums (some only available on Bandcamp or at gigs), the latest being 2013's "The Line", their debut on Concord Records. Each musician brings his own influences to the music and the blend is often quite exciting. Kneebody plays 2 sets - 8:30 and 10 p.m. (separate admission to each) - and you can find out so much more by going to firehouse12.com or calling 203-785-0468. Learn more about the group by going to kneebody.com. The final track on the CD, "IM Park (To Diego Barber)", is a piece composed by Spanish guitarist Ricardo Gallen (whose Sunnyside recording of "Bach: Complete Lute Works" is stunning) yet the first half is all piano. Taborn, who seems to be able to play just about everything, gets to the heart in the music so, that when the guitar enters, Barber picks up the emotion and carries it through the splendid second half of the piece. Is "Tales" jazz? Is it classical? Yes, no, who cares? This is music that transcends labels and technique; Diego Barber, along with Craig Taborn, merge beauty, song, and emotion to create quite a listening experience - do listen. For more information, go to www.sunnysiderecords.com/artist.php?id=356#news. Guitarist/composer Brandon Ross is in the midst of a career that has seen him collaborate with artists such as Henry Threadgill, Cassandra Wilson, Bill Frisell, the late Lawrence "Butch" Morris, Wadada Leo Smith, Jewel and many others. Ross is also the co-leader of the "power" trio Harriet Tubman. His latest project, For Living Lovers, finds him in an acoustic setting with bass guitarist Stomu Takeishi. Their debut recording, "Revealing Essence" (Sunnyside), first began to take shape in a series of sessions over 2 days in December 2009 in the Firehouse 12 recording space. With the inclusion of 2 tracks recorded in New York City and Tokyo, Japan, the project was complete by September 2013. The music Ross and Takeishi consists of ballads that are often stark, fairly quiet, angular, spacious, a blend of originals and smartly chosen interpretations of 2 of the 3 "Danse de Travers" by Erik Satie and Ornette Coleman's "Night Plans" (first recorded in 1996 by Coleman in a duo setting with pianist Joachim Kuhn). This music seems to exist on the edge of one's consciousness; the pieces insinuate themselves into your brain as if in a dream. All of a sudden, one realizes Ross is playing banjo or creating feedback (as he does masterfully on "Lotus Blossom") or that the piece you think might be a Delta blues song is actually Satie's "Danse de Travers I" - Takeishi's simple yet effective bass lines (he's playing acoustic bass guitar) draw one in, pushing you deeper towards the core of the music. The unaccompanied banjo music of "Iago Whispered" is a wonderful and subtle blend of traditional African and modern European classical influences. A Kabuki feel permeates the opening section of "Saturation", the terse, short, notes over the abrupt bass chords and notes paint an impressionistic landscape that slowly moves forward, never quite losing the solemnity of the earlier section. "Thanks (for J-R)" closes the program with, perhaps, the prettiest melody on the disk and the one with the most dynamic variation. 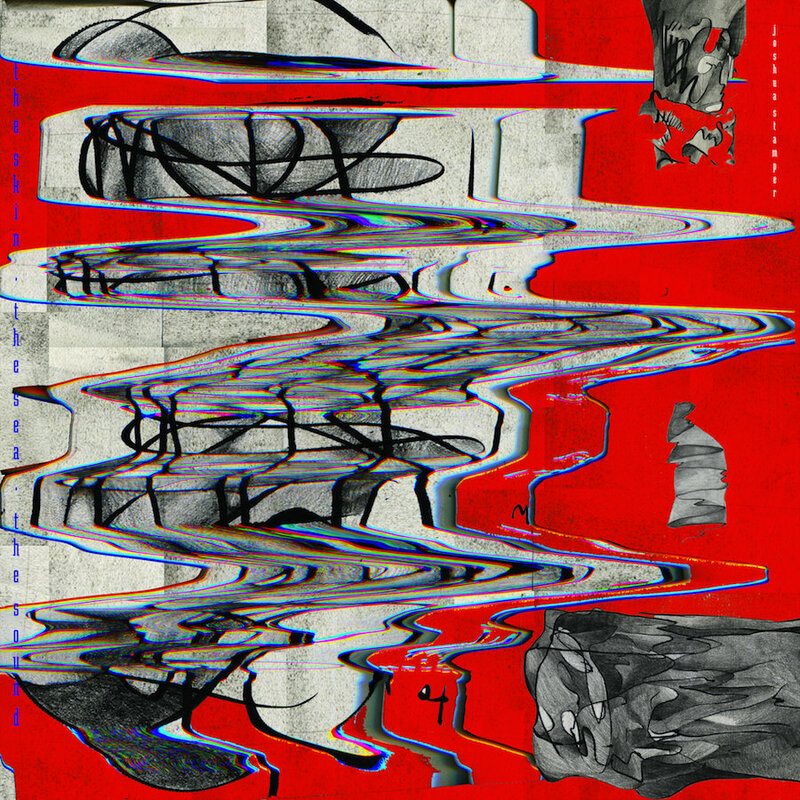 It strikes one on multiple listens to this music by Brandon Ross and Stomu Takeishi that the duo has stripped away the unnecessary elements from these pieces and that the "Revealing Essence" is truly the heart of the creators. That "heart" can not and should not be separated from the "heart" of the music. For more information and to hear music from the CD, go to sunnysidezone.com/album/revealing-essence-ft-brandon-ross-stomu-takeishi. The duo returns to Firehouse 12 for a concert on Friday May 30 - go to firehouse12.com for more information.